Sometimes, it is easy to get caught up in minutiae and lately, reading a lot of arguments amongst nutritional gurus, it seems all they care about is the details, missing the vast majority of what we agree on. I find similar arguments occurring in my head when I get caught in the details sometimes, depending on which research I've read most recently and which symptoms are bothering me most. We know what's wrong. We know most of us mostly eat processed foods full of crap. We also know the USDA guidelines are not optimized for human health. They emphasize grains, which are very low in all necessary micronutrients, thus mostly empty calories even if you ignore the issues with anti-nutrients. They lump together all fruits and vegetables as if potatoes and raisins are nutritionally equivalent to kale and blueberries on either macronutrient or micronutrient levels. And they minimize the necessity of fats, in a world where many of us are low on fat-soluble micronutrients; of the fats they allow, they prefer the inflammatory high omega 6 fats. So we know the USDA is not the ultimate purveyor of optimal human health. What do we know that is right? We know foods contain macronutrients (carbohydrates, protein and fat) and micronutrients (vitamins, minerals and phytochemicals). Of the macronutrients, we know we don't really need much carbohydrate since the body makes glucose out of both protein and fat when needed. We know we need some protein, which cannot be made from the other macronutrients and must be had directly. And we know we need some fats, saturated fats including medium-chain triglycerides, monounsaturated fats, and polyunsaturated fats limited except for CLA, EPA and DHA. Of the micronutrients, we have vitamins, minerals and phytochemicals of both the water-soluble and fat-soluble types. We also know there's anti-nutrients (phytates and lectins) which prevent us from absorbing micronutrients and outright toxins in some foods. In summary, we need good protein and healthy fats from both water-based and fat-based foods. Jackie's food groups and "eating groups"
and a quarter as everything else. Pick some of these of different colors and eat more of them by volume than any other food. Get them from your garden, a CSA, a farmer's market or a grocery store. Get them organic or non-organic, fresh, frozen, dried or even canned. Eat them raw in salads, juiced or in smoothies; eat them fermented; eat them cooked via boiling, steaming, frying, braising, roasting, pressure cooking or microwaving; eat them in soups, stews and casseroles. Add some fat to improve the bioavailability of nutrients: cook with butter, coconut oil, lard, schmaltz or tallow or dress with avocado oil, butter, coconut oil or olive oil. Pick some of these that you like and eat a decent serving with every meal. If pastured or wild-caught, get the highest-fat versions and eat them with all their natural fats. If from a cheap source, get them low-fat as toxins are concentrated in fat and the fat won't have much nutrition anyway. Make up for the lack of good fat by cooking or eating with lots of butter and coconut oil. Fill in the rest of your diet with low-sugar fruits, starchy vegetables, high-sugar fruits, nuts & seeds, legumes, grains, sugars, processed foods and alcohol. The details here depend on your genes, the epigenetic expression of those genes, known health issues you have and any dietary religion you subscribe to. Close list of nonstarchy vegetables (X). Close list of good proteins (X). sugars - White sugar is universally considered bad by pretty much everyone. HFCS is possibly worse, and agave is much worse than HFCS. Natural sugars, such as honey, maple syrup, molasses, whole cane sugars and ground dates have slightly more nutritional value that white sugar, but are still primarily sugar. IMO, natural sugars are beneficial because baking with them along with healthy fats, results in a richness that precludes using much of them. Artifical sweeteners do not effect bG/insulin in the same way as natural sugars, but their long-term health effects are not known and they are controversial, especially aspartame. Short term effects of the sugar alcohols in particular include diarrhea. processed foods - This includes pretty much the vast majority of products sold in your average grocery store, which I deride by referring to them as "food-like products" rather than food. If it is shelf-stable, if it has a label with a list of ingredients, it is a processed food. Most restaurant food is also processed food as few cook from scratch with real food ingredients. Some processed foods are better than others. Read labels and avoid omega 6 fatty acids (soy and canola oils are the worst, but all seed oils are guilty to a lesser degree). Many of the foods I consider pantry staples are processed foods: coffee, coconut oil, coconut milk, coconut flour, almond meal, nut butters, baking soda, apple cider vinegar, canned meats and seafood, baking soda, tapioca flour, spices, cocoa, dark chocolate, semi-sweet chocolate chips and raisins. But there's always those times when you need something quick. I like Larabars for that, though they are rather high in sugar, they beat hitting a drive-through. Obviously, there's WAY more processed foods than I've mentioned, bagels, breads, cereals, cake, lunch meats, frozen pizzas, frozen ravioli, ice cream, pasta, I can't possibly make a comprehensive list. It's almost everything the average person considers food. IMO, these foods should never be allowed to crowd out the needed nutrition from eating your veggies and proteins with healthy fats, and usually you'd be better off with any other food group. alcohol - I include alcohol as a food group mostly because it is not only a drug, but since it has significant calories, it can displace other foods. Those who ferment foods or make their own extracts are ingesting very small doses, too small to intoxicate. Red wine is good for heart disease primarily due to resveratrol, which is obtained just as easily by eating grapes. However, research does indicate that 1-2 beers, 1-2 glasses of wine or a shot of distilled spririts daily is apparently healthier than no intake at all (with the exception of those with alcohol issues). I have wondered if this is due to cortisol issues; alcohol's drug effects lower stress and relieve pain. Close details for everything else (X). Rather than tell you what is wrong with your dietary religion (which many folks subscribe to more fervently than their actual spiritual beliefs), I am instead going to give advice about how to maximize whatever eating plan you follow with my "eating groups". Click to see my advice about calorie restriction, low-fat, low-carb, vegetarian, WAPF/Traditional Foods, gluten-free, GAPS, Paleo/Primal and AIP diets. There are two basic types of calorie restriction diets, those intended for weight loss and those intended for life extension. In either case, limiting food intake is a big consideration of the diet. IMO, when food intake is limited, it is even more important to emphasize nutrient-dense foods, so the best way to do these diets is pretty much with the two primary "eating groups" I've identified and restricting everything else. The most common mistake people tend to make on calorie restriction is going too low calorie and thus trashing their metabolisms. If you're restricting calories for weight loss, this is a lose-lose game. Again, there's two basic types of these diets, those intended for weight loss and those intended for heart health. IMO, these diets tend to overemphasize the nonstarchy vegetables and underemphasize the good proteins. Generally, they use a lot of grains, starchy vegetables and high-sugar fruits for non-fat calories, which runs the risk of crowding out the nutrient-dense foods from my two primary "eating groups". But if you limit these low-nutrient foods to your 25% and eat enough fat to both absorb your water-soluble micronutrients and get your fat-soluble ones, you can do a healthy relatively low-fat diet. The primary problem people tend to make on low-fat diets is going too low-fat and thus winding up deficient in vitamins A, D3, K2 and the fatty acids DHA, EPA and CLA. You can't go extremely low-fat and be healthy. Low carb diets are usually undertaken either for weight loss or for blood glucose control. Both my primary two "eating groups" are naturally low-carb, so just eating more of them to fill in the other 25% makes for a low-carb diet by default. Slightly higher but also low-carb diets can include limited amounts of low-sugar fruits, nuts and seeds, but need to restrict legumes, starchy vegetables, high-sugar fruits, grains and sugars. The largest mistake people tend to make on low-carb diets is eating lots of processed foods - low-carb does NOT mean "good" food. Keep the low-carb crap to the 25% and eat your veggies and meat. Vegetarian diets are usually chosen for religious or ethical/moral reasons but sometimes for health reasons as well. In terms of my "eating groups", please actually eat loads of vegetables as there's nothing sadder than a vegetarian who doesn't eat vegetables! Eat a lot of high-quality eggs, cheese, milk and butter for sufficient B-12, easily absorbed protein and the fat-soluble micronutrients. If you don't eat much roe, consider supplementing krill oil for DHA and EPA. The primary concern with a vegetarian diet is with the extremist vegan diet. People do not have the four stomachs of cows full of different bacteria building nutrients for them, we simply can't get enough of the animal-based nutrients without eating animal foods. We don't need meat, but do need animal foods. The entire intention of the WAPF/Traditional Foods diet is to maximize health. IMO, this diet tends to overemphasize animal foods and underemphasize plant foods. You want to ferment some of the items in my two "eating groups". There's also an emphasis on using the highest quality dairy: pastured and raw. Bone broths also have a high priority, both for gelatin and minerals. The most popular fats are cod liver oil and high-vitamin butter to get sufficient fat-soluble micronutrients, but coconut oil is a close third. The 25% will include nuts and seeds, legumes and grains, all prepared to minimize the anti-nutrients via soaking, sprouting or souring. They allow natural sugars such as whole cane sugar, maple syrup, honey and molasses. 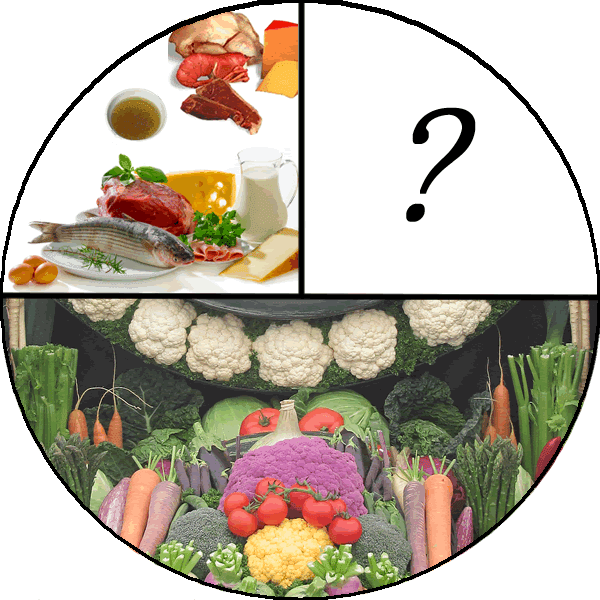 IMO, the largest error people make with this diet is letting the 25% crowd out the 75%; there's only so much sourdough bread slathered in honey that you can eat and still call it a healthy diet. GAPS is a 3-prong program that includes a Traditional Foods diet with many more restrictions added, including being both gluten-free, casein-free, nightshade-free and relatively low-fiber at the beginning. The intention of GAPS is healing & sealing the gut. However, from the most restrictive phase 1 of the introductory diet to the most lenient full diet, ample veggies, meats and broth are not only allowed, but required. The most commonly used starchy vegetable on GAPS is winter squash and the primary legume is the navy bean, so these foods get a lot of play in your 25%. Honey is the only officially allowed sweetener, but many people seem to use stevia in spite of it being disallowed. Following the diet as written, you'd have difficulty NOT meeting my criteria for a healthy diet on GAPS. Celiacs have an autoimmune disorder in which exposure to gliadin, the glutenous protein in wheat, rye and barley, causes their immune system to attack their bodies, especially their guts but many other systems as well. There is also a group of people with a disorder known as Non-Celiac Gluten Sensitivity (NCGS) which is not as well characterized as Celiac Disease (CD) in the medical literature as yet. For these folks, the GF diet is not a matter of choice, as many get violently ill when exposed to even the smallest amounts of gluten, such as occurs with cross-contamination (e.g. using the same butter that has previously been double-dipped by someone buttering wheat toast). Even those without specific symptoms of being "glutened" are causing long-term damage to their bodies when exposded to gluten due to their disease. While not as extreme as an anaphylactic-type allergy, the necessity to avoid gluten is just as serious. Aside from those with CD or NCGS, there are 3 other classes of folks doing gluten-free diets. First are those who believe that basically everyone has NCGS, that the human gut is simply not intended to digest gliadin. The idea that wheat specifically is poisonous had been popularized by the book Wheat Belly. Ironically, some of the folks are experimenting with older forms of wheat, such as spelt and triticale, which do contain gluten, so are doing a low-gluten diet rather than a gluten-free diet. Second are those who believe that all grains that contain proteins similar to gluten are equally bad, who opt for an entirely grain-free diet. There is some overlap between this group and the Paleo diet, which is also a grain-free diet. And finally, at the moment, there is a celebrity fad going on in which gluten-free is being used as a weight loss diet as well. Regardless of the reason for doing a gluten-free diet, my primary "eating groups" do not contain gluten (assuming no cross-contamination issues). The primary problem people experience doing a GF diet is replacing all of the foods they can no longer eat with GF alternates. Non-glutenous grains and starchy vegetables are relatively low nutrient foods. People with gut issues and malabsorption need all the nutrition they can get so really should limit these foods and go for the nutrient-dense foods. Like Traditional Foods, which this diet overlaps with to some degree, the primary intention of this way of eating is overall health. IMO, on the surface, these diets tend to overemphasize animal foods and underemphasize plant foods, but when you get into the details, that's rarely the case. Pastured meats, wild-caught meats, seafood and organ meats are highly valued. Paleo likes bone broths too. The 25% will includes starchy vegetables (usually excluding potatoes), both low-sugar and high-sugar fruits and nuts and seeds. Various forms of Paleo/Primal nearly always exclude grains and legumes, both of which contain anti-nutrients (phytates and lectins), whereas some versions allow dairy and others do not. IMO, the most common problem is an overabundance of date-sweetened almond meal goodies, as that's a lot of sugar and omega 6s if done to extremes. I don't have a full understanding of AIP, I've just some cursory reading. But as far as I can tell, just as GAPS is a more restrictive version of Traditional Foods, AIP is a more restrictive version of Paleo. As with GAPS, it would be difficult to do AIP without piles of veggies and good protein foods. If recipes on web sites are indicative of what is eaten on AIP, the 25% uses a lot of plantain as opposed to winter squash being used on GAPS as the primary starchy vegetable. Close discussion of popular diets (X). Summary - so which diet is best? Truly, I don't think it matters for most people. If you're eating all your veggies and protein with healthy fats, you've crowded most crap out of your diet. I am of the opinion that if you have good genes and are relatively healthy, you can get away with the other 25% of your food being candy, cake, ice cream and pie! You'd still be ahead of 99% of the folks out there who are eating mostly food-like products with little nutrition rather than actual food, let alone nutrient-dense food. That is good enough for many folks. It's the advice I always start with when asked about nutrition. However, if you keep asking, I can spout lots more! For people who don't want to think about it a lot - just eat real food, mostly nonstarchy veggies and protein well lubed with healthy fats. That's it. You don't have to be either a biochemist or a gourmet chef, just eat real food.